Stardew Valley is Eric Barone/ConcernedApe’s love letter to farm/life simulation games such as Harvest Moon. Originally released for Windows in February 2016, publisher Chucklefish Games ported the game to many other platforms, and the game has finally seen release on the PlayStation 4. So is this a successful port, or should the ambitious title have stayed on the PC? Let’s find out. First, it should be said – if you’re not intrigued by the idea of living off the land, nursing a farm back to health, growing relationships (romantic and otherwise), raising a family, fishing, spelunking, and taking it easy, then this is probably not the game for you. Stardew Valley represents a modern take on the classic Harvest Moon formula; mixed with heaping portions of Animal Crossing, Minecraft, Terraria, Rune Factory, and other games of the like. The most action you might see here would be in the game’s mines, which involves fairly basic combat (more on that later). You play as a former city boy/girl who received a message from your grandfather on his deathbed: an envelope with instructions to not open it until the time comes when modern life has crushed your spirit, and you need to break free. Well, that time comes soon enough, as you find yourself working for the soulless Joja corporation, which is an obvious homage to Amazon and other mega-corps. This envelope ends up being the deed to your grandfather’s farm, which has been neglected for far too long. It’s now your job to improve the farm’s condition, but other responsibilities may soon be yours to bear as the town that the farm is situated in has also seen better days. Days progress rather quickly in Stardew Valley. Time progresses in chunks of 10-minute intervals, each of which only lasts 7.5 seconds (that means 45 seconds real-time is one hour game time). Each year of the game is divided into four seasons, each of which are 28 days long. Each season has its own unique catchable fish, town events, harvestable crops, and other time-specific mechanics to get used to and take advantage of. I would have loved to see an option to have the game behave a bit more like Animal Crossing, where the game’s clock is based on the real date/time, but things would’ve progressed so much more slowly if that was the case. There’s a dating simulator in Stardew Valley, because of course there is. You can talk with everyone in the town, and depending on what dialog transpires, you can become romantically involved. You can hand out gifts to others, with results ranging from outright disgust to appreciation, and completing quests as posted on the town’s message board will also improve the quest giver’s attitude towards you. Eventually, you can fall in love with another character, marry them and raise a family. Gay/lesbian relationships, complete with adoption of children, is also allowed, and seen as no big deal in this game’s world. You could probably play this game as strictly a dating simulator and get away with it, since the mantra of “do whatever you enjoy” appears to apply to the entire game. As you play Stardew Valley, you’ll accumulate experience depending on the things you do. Thankfully, you are given all the tools you’ll need to pursue various professions, which never break. This includes a pickaxe, axe, hoe, scythe, watering can, and fishing pole. Catch enough fish, and you’ll level up. Level up enough, and you’ll learn crafting recipes for new fishing-related items; the same applies to every tool. If you interact with the television installed at your house, you can even learn cooking recipes, to be used when preparing food in the kitchen of your house, should you choose to pay for that upgrade. If there is an ultimate end goal in Stardew Valley, I kind of don’t want to reach it. Much like Animal Crossing or No Man’s Sky, I enjoy setting my own personal goals, and then playing the game without reaching some final conclusion; the joy of completing my own thought-up missions is reward enough compared to seeing some “victory” graphic. Thankfully, Stardew Valley provides random quests, requiring items to please another villager, which will give the aimless something to shoot for. 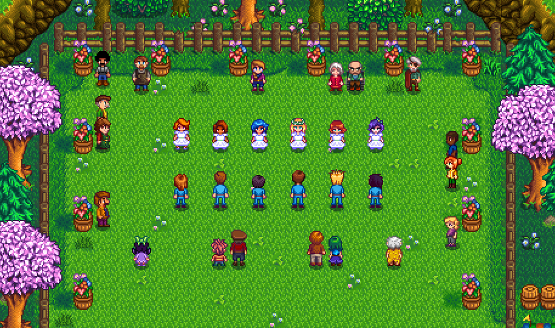 While certain events occur early on in the game, there isn’t an official end, which should mean people will be playing Stardew Valley for years to come. The graphics in Stardew Valley feel ripped straight out of the SNES era. The village of Pelican Town and surrounding areas are brightly colored, varied in features, and pleasant to look at. Even background plants are animated, occasionally wafting in the breeze (depending on the season, naturally). Forests, deserts, beaches, rivers, and the ocean are all featured and intricately detailed with graphics that were lovingly, amazingly, created by one person. Audio is also appreciably fitting, featuring chiptune-like music and retro-inspired sound effects. A few ambiance tracks, such as the beach, sound a bit higher-res than could otherwise have been achieved during the real 16/32-bit era of gaming, but otherwise fits in just perfectly. Listening to Stardew Valley can take many a nostalgic gamer back to their earlier years. 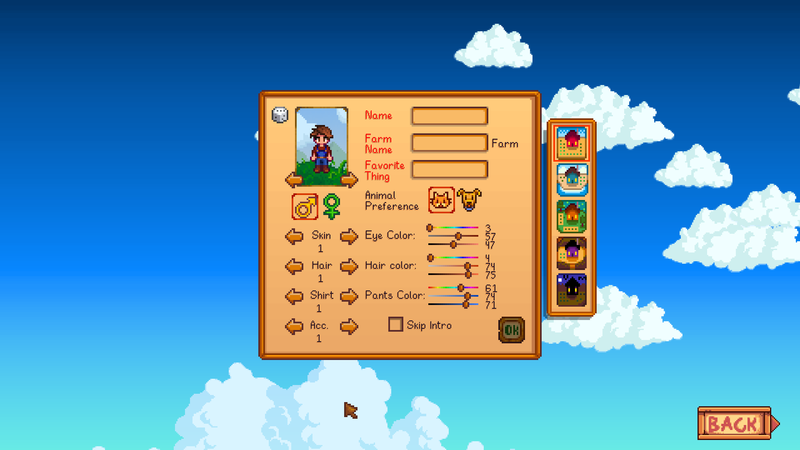 Stardew Valley’s legacy of being developed for PC shows a bit with this port. The game starts with showing a red mouse cursor, which isn’t really a good sign. It even interferes with the game’s few cutscenes, which has to be moved out of the way with the left analog stick. Not a deal breaker, of course, but annoying nonetheless. Given the game’s PC roots, it was surprising to see that the DualShock 4’s capable touchpad is not used beyond the button for bringing up currently active quests. The touchpad is accurate enough to move a cursor, so it’s a shame to see it wasted in Stardew Valley. Combat is also a weak point. You can only hit in one of four directions, but can be attacked from all around. Thankfully, combat is not a major portion of the game, and can be avoided for the most part. The guild in town offers rewards the further you go into the mineshaft, but other than that combat is strictly an extra. Still, like most every other facet of Stardew Valley, combat is deeper than it may appear at first. You can purchase or find new weapons, and there are rewards which you can only earn at the Adventurer’s Guild. There are multiple types of weapons, as well. Stardew Valley represents a major break from reality. It’s a game where things are simple, but there’s always something new to do. It’s a collector’s haven; a lover’s respite (at least until co-op arrives in the future). This will represent many things to many gamers. Yet the one thing it will remain for as long as people are around to play it, is a magnum opus of the indie developer. Stardew Valley is a game so completely full of content, that it is hard to fathom that it was created by a single person. With a ton of secrets to discover, and fishing, farming, mining, smelting, and even dating as activity options, this feels like a perfect mix of life simulation games of the past, with a decidedly modern take. Hopefully ConcernedApe continues in his relentless march to build the perfect game for this genre, and we can all share in the fruits of his tireless labor. Stardew Valley review code provided by publisher. For more information on scoring please see our Review Policy here.